Daniel Peña's chilling new novel Bang (Arte Público Press) dares to enter the landscape of drugs and violence that has besieged Mexico, particularly along border cities like Matamoros, where part of his novel is set. Araceli and her sons Uli and Cuauhtémoc, are members of an undocumented family residing in Harlingen, Texas. A twist of fate sends them back to Mexico, not through deportation (as the mother always feared), but through an unusual set of circumstances. They become separated and suddenly they feel as invisible and vulnerable south of the border as they felt in the U.S. Each must struggle to survive a dangerous Mexico they no longer recognize, knowing all too well that the odds of a happy reunion are stacked strongly against them. Peña is currently an assistant professor in the department of English at the University of Houston-Downtown. Formerly, he was based out of the Universidad Nacional Autónoma de México (UNAM) in Mexico City where he worked as a writer, blogger, book reviewer and journalist. He is a Fulbright-Garcia Robles Scholar and a graduate of Cornell University. Bang is his first book. RG: Bang is such a timely novel that offers devastating insights into how communities adapt to severe shifts in culture and society. And yet encounters with the troubling “new normal” of contemporary Mexico gain fresh perspective through the harrowing experiences of Araceli and her two sons. What inspired you to write such a specific journey about three undocumented Mexicans in the U.S. finding themselves back in a country they once called home, but which has now become foreign to them? DP: In the beginning, I only wanted to write a novel about dignity. If you dig enough, dignity is at the center of most geopolitical issues: transmigration, the drug wars, black markets, the rise of populism in North America, but arguably separatist movements in Europe too and various brands of extremism throughout the world. When systems fail people, they create their own systems. And I think that’s a major facet of the drug war in Mexico that hasn’t been articulated yet—the human element of it, the basic human need for dignity at all costs. Writing from that intersection of dignity between immigration and the drug war, I found that the two are actually more symbiotic than not—they feed off each other. And that’s how I got to the current iteration of the novel, which is a long meditation on what happens to the people we shut out (or kick out) of America and the way those people are absorbed into the drug war in Mexico. In a microcosm, Bang is a novel about how American immigration policy directly feeds the black market machines we’re supposedly invested in ending. And to that end I hope Bang raises a few questions: Is the drug war in Mexico failed by design or by accident? And if by accident, do we keep feeding that machine resources and brown bodies if only to destroy them, those people who would otherwise be absorbed into the American fabric? And what if failed by design? What does that say about us that we keep feeding it? RG: Araceli’s journey is especially heartbreaking because so much sacrifice is demanded of her in service to her sons: she remains in the U.S. after her husband is deported, and then goes searching for them when they vanish across the border. In many ways, she’s the ultimate hero in the story because of the many trials she endures on her quest. How do you see the dimensions of Mexican motherhood and womanhood changed because of the current state of affairs in Mexico and the U.S.? DP: I think women largely bear the brunt and burdens of the drug war in Mexico. Much has been written about the femicides and I write toward that a little with June’s sister in Bang, but I feel like the demands on Mexican motherhood and womanhood mirror those demands that were put on women in places like Chile during the Pinochet regime or Argentina during the dirty war. When the state can’t provide closure, the burden falls on mothers and women to do that job for them. We saw this with the Ayotzinapa killing of 43 students in 2014. We see it with the Juarez mothers’ searches that continue to this day. We see it in crime scenes all over Mexico in which women are consistently the ones demanding answers to questions surrounding their loved one’s death to facilitate that closure. That expectation is there and I think it’s a troubling relationship that the Mexican state (and the United States by extension) cultivates with Mexican women. That labor is not free. Nor is it easy. And I really wanted to show this with Araceli who is very much the hero of Bang. She’s my favorite character in the novel. Sara Uribe writes about this kind of labor in her incredible book, Antígona González, which chronicles a sister’s wait for her disappeared brother in Mexico. I highly recommend it. RG: Uli and Cuauhtémoc have their respective adventures in Mexico—both storylines difficult to navigate because we see two young men, promising student athletes, become emotionally hardened by their new surroundings. In some ways, they represent people embroiled in the current political fray over DACA, whose uncertain future threatens to disrupt the lives of those undocumented immigrants who arrived from other countries as children. What messages do the brothers’ stories carry across the border about identity, belonging, and home? DP: I think both Uli and Cuauhtémoc feel very American at heart. They’re huge San Antonio Spurs fans. They love Whataburger. They listen to Jay-Z. They’ve completely bought into the idea of America though they understand that America hasn’t completely bought into the idea of them yet and I think one of the great tragedies of the book is when they discover (in their own ways) that Mexico hasn’t bought into the idea of them either. It’s ultimately the black markets (or underground economies) that find their talents useful. Going back to the idea of dignity, the pursuit of dignity is the thing I think that drives people on both sides of the border. For a lot of people, immigrating to the US offers one path toward dignity. DACA was a huge step in the right direction for people like Uli and Cuauhtémoc who have so much to offer this country. But for those shut out (or kicked out) of America, a cartel provides dignity too: if you need to feed your family, say, or if you’re recently deported and you can’t find a job - it’s the only means of survival possible. Globally speaking, it’s a privilege to buy into the “right” kind of system, the legal way of doing things. Those that do would like to believe that the right system is the only system that matters, the only system that has any gravity. But we know that all systems (legal and not) have momentum and certain demands in exchange for dignity. 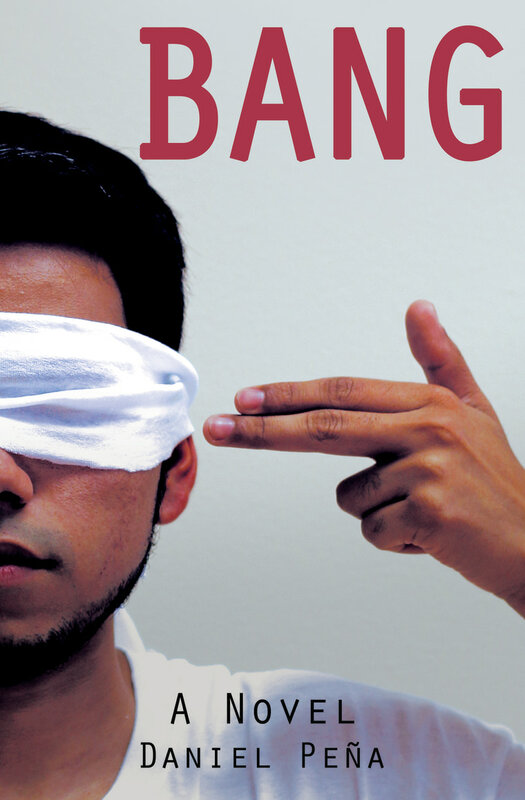 Ultimately Bang is about a family torn apart by those systems and the way systematic demands manifest and change their identities. If there’s a message to be relayed by the brothers’ story it’s really a question: can you blame someone for pursuing their dignity? And if so, what about life, liberty, and the pursuit of happiness? RG: Bang is so skillfully plotted and every obstacle the three main characters confront is balanced by the alliances they make, moments of blind luck, and street smarts that suddenly kick in for all of them. Without giving away the ending—it’s quite powerful and earned, by the way—why did you choose such a bleak direction for the conclusion? DP: Thank you! I’m so touched by these kind words. I was joking with a friend the other day that the French writers are the only ones who get to write a bleak ending and get away with it. But you know what? Mexican-American writers too! I did worry about the ending quite a bit. A lot of people I really admire and respect asked me to change the ending, but I felt like it was important to look that trauma directly in the eye and to convey the severity of it with as much honesty and empathy as I could. I haven’t mentioned this yet, but most of this book is based on real events—real things that have happened to real people. Most of it is ripped from research or the news. And in writing Bang I was very conscious of maintaining respect for that trauma, which also meant not shying away from it either. I think there’s a lot of pressure, especially on writers of color, to provide the reader with some hope, some beacon of light from the trauma of their stories or even their personal lives. There’s an expectation that we give the reader something to feel good about. But I have none of that. And any other ending to the novel would have felt disingenuous. RG: You are currently a resident of Houston, and it’s difficult to resist asking about how recent events and post-hurricane life has affected your vision as an artist. Where do you sense the muse taking you next? DP: Living through Hurricane Harvey renewed my faith in the general goodness of people, which was a tall order in the wake of the 2016 election. I feel like something that hasn’t been written about Harvey yet is how many people saw it as a chance at redemption. Like everywhere else, we saw in Houston, too, that so many people had bought into the animosity and vitriol of the election cycle. We retreated into our digital news bubbles or hermit kingdoms or whatever. But then the electricity went down—PUM! We had each other. And that was it. That was literally all we had. And our survival depended on whether we could trust each other and buy into in the general goodness of our neighbors. And we did. And the social fabric held. Houston is a blue city, the most diverse city in the country, but it’s surrounded by red and many of those folks were impacted too. We were all in it together. And everywhere you saw redemption stories. People risking everything to save people I’m sure they’d voted against in the general election, that deep desire to prove that we valued each other at all costs. And that was powerful. We bought out of everything for a few days and bought into each other. And we survived. As an artist, I’d never thought about the deep need for redemption. I’m sure if you would have asked someone point blank why they’d risk their life for a complete stranger they would have said they were simply doing the right thing, but there was a certain urgency to it, a cathartic exculpation of shame—we’d been suspicious of each other not too long before the storm. Houston felt like a divided city in the immediate aftermath of the election. This was our way of pushing beyond that quickly. It changed Houston forever, I’m convinced. And maybe that’s a sliver of hope for the American experiment at large—I don’t know yet. I’ll write about the flood, but not now. It’s too close.